INDIANAPOLIS - The top performers of the Pittsburgh Pirates farm system were announced today by MiLB.com as part of the site's annual organization all-star awards. Of the 12 players recognized, five took the field for the Indianapolis Indians in 2018. Below are the players who spent all or part of 2018 with the Tribe and their combined season statistics. Kramer excelled with the Indians this past summer, slugging a team- and career-high 15 home runs en route to Team Rookie of the Year honors. He paced the Tribe with 148 hits, 35 doubles and 59 RBI, and he also chipped in 13 stolen bases. His performance with Indy earned him a September promotion to Pittsburgh, where he hit .135 in 21 contests. Kramer could make Pittsburgh's 2019 Opening Day roster with a good showing at spring training, but another infield acquisition by the Pirates may force him back to Triple-A for further seasoning. Newman, 25, received honorable mention by MiLB.com for his play in 2018, falling in a close race with Cole Tucker, Indy's projected 2019 Opening Day shortstop. In 109 games with the Tribe, Newman hit .302 with 36 extra-base hits, 74 runs scored and 28 stolen bases, numbers that garnered him Team MVP honors. He was promoted to Pittsburgh in mid-August and batted .209 in 31 games. Despite his slow start at the game's highest level - something Newman has shown every time he makes a jump in the minor leagues - he still projects to crack Pittsburgh's 25-man roster out of spring training, sharing time with the recently-acquired Erik Gonzalez at shortstop. Martin made a strong impression on the Pirates organization after being acquired in the Gerrit Cole trade last January. The left-handed hitting outfielder torched Double-A opposition with the Curve, batting .325 with nine homers, five triples, 13 doubles and 49 runs scored in 68 games. He then tripled in his first plate appearance with the Indians but only slashed .210/.270/.319 in 59 International League games, his first taste of Triple-A pitching. Martin's upside resulted in the Pirates adding him to their 40-man roster. Barring any additional outfield injuries and/or trades at the major league level between now and Opening Day, the 23-year-old appears destined for a return to Indianapolis in 2019 with a big-league debut on the horizon. Brubaker's impressive 2018 campaign culminates with him being named as the top right-handed starting pitcher in Pittsburgh's farm system, no small feat considering one of the game's best right-handed hurlers, Mitch Keller, tops the organization's prospect rankings. 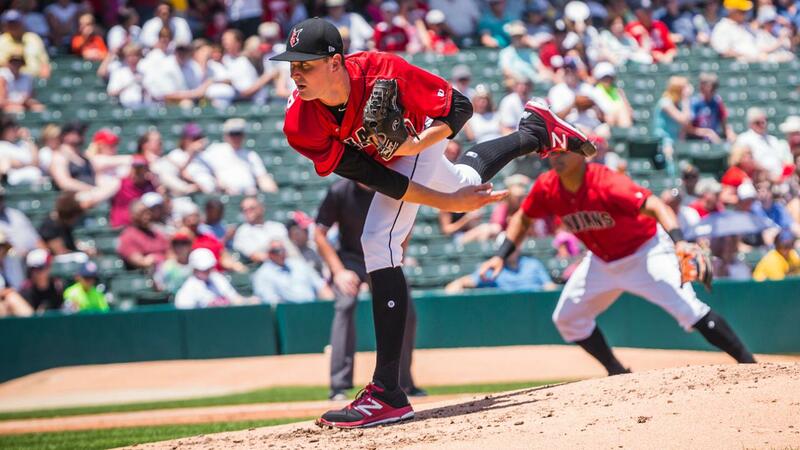 Brubaker began the season in Double-A, where he went 2-2 with a 1.80 ERA in six starts. He quickly made the jump to Indy in May and posted an 8-4 record and 3.10 ERA in 22 outings, five of which were scoreless starts. He led all Pirates minor leaguers in ERA and was second in strikeouts (131) to Keller's 135. Brubaker was one of four additions to Pittsburgh's 40-man roster this November, protecting him from the upcoming Rule 5 Draft and putting him in line to make his MLB debut in 2019. Waddell adds a second career MiLB.com Pirates Organization All-Star honor (also: 2016) to his pedigree after going 7-9 with a 3.59 ERA in 28 games (23 starts) between Double-A Altoona and Indianapolis. Like Brubaker, the 24-year-old Waddell opened his season with the Curve and dominated Eastern League opposition, going 2-1 with a 2.68 ERA in nine games (eight starts). With the Tribe, he registered a 5-8 record and 4.19 ERA in 19 games (15 starts). Waddell was not among Pittsburgh's 40-man roster additions, leaving him unprotected for the Rule 5 Draft. If he goes undrafted, expect the southpaw to slot in behind the right-handed duo of Brubaker and Keller in Indy's 2019 rotation.